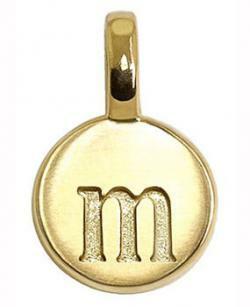 Wearing a gold initial pendant is a subtle and classy way of proclaiming your identity. These fashionable pendants come in a wide range of different styles, gold tones and accents, making it easy to find one that can work for you. The gold disc initial pendants at SonyaRenee (pictured above) are one of the site's best sellers. This style is a perfect subtle pendant to add to any casual outfit you want to dress up a little. Each disc is made of 14K gold and is engraved with your choice of font including Roman, Circle Monogram, 5 Line Fancy and Wedding Font. Each disc can be engraved on the front or back and you have the option of adding additional discs as well as a birthstone pendant accent. The discs come on a 16-inch 14k gold chain, and you have the option of upgrading to a longer and/or thicker chain. Each disc measures approximately 1/2-inch in diameter, with 18 mm and 22 mm discs available for an additional cost if desired. The price of a basic pendant is $250, with higher prices for size increases. Allow three to five days for engraving and personalizing. Special orders may take up to three weeks for delivery. Shipping starts at around $9 for ground shipping; faster shipping is available for an additional charge. Create your own necklace out of a set of hand-sculpted Alex Woo Mini Addition initials from Nordstrom (pictured right). Each tiny, 1/4-inch diameter pendant necklace is made out of 14k yellow gold and is made to decorate any Alex Woo chain (sold separately). Each initial is stamped in lowercase typewriter font on the front of the disc, giving the pendant a unique look from typical stamping or engraving. A chain is not included. These pendants qualify for free shipping. If you're looking for a very simple initial design, consider the Duragold 14k yellow gold initial pendant necklace from Amazon (pictured right) This highly polished pendant has sharp, crisp engraving that allows the initial to stand out. The pendant is small, measuring .64-inches in height by .5-inches in width, making it perfect for layering with other initials to complete your family's set. The Duragold that it's made from is meant to last without scratching or tarnishing, so you can wear it longer without care. Customers like the fact that the pendant is simple, but elegant and is the perfect size for layering. The pendant comes with an 18-inch gold cable chain. The necklace sells for $99. If you like the appeal of handmade and hand-stamped items, consider this 14k gold initial pendant from ProlifiqueJewelry. These tiny, 3/8-inch pendants are hand stamped with a custom font for a personal, unique touch. Each pendant can be further personalized by having the initial blackened to make it more visible or left natural for a subtle look. You also have your choice of font, as well as uppercase or lowercase lettering for the initial. Customers love how delicate the finished pieces are, as well as the personal touch of working with the artist to create something unique for them. Each pendant comes with a 16-inch 14k gold chain. Both 18 and 20-inch chains available for additional purchase. Each piece retails for $149. Engraving takes four to seven business days to complete before shipping. The pendant ships for $7 to anywhere in the US. If you like the look of monograms but want a disc-style pendant, consider this monogram disc from Miriam Merenfeld (pictured right). 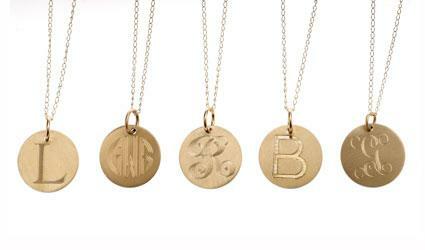 Each necklace is gold-filled and the 7/16-inch diameter disc is engraved to order with your initials. Wearing a disc with your complete monogram on it provides you with a personalized look that stands out from single initial pendants. The disc has a polished finish that gives the pendant an elegant look that pairs well with the engraved script. Customers like the way that it looks and feel that it has a dainty look to it. The pendant comes on a gold-filled chain measuring 18-inches long. The chain has a spring clasp. The pendant retails for $63 from Max & Chloe. The pendant ships for approximately $5 ground; additional methods of shipping are available at an additional charge. If you want an initial pendant that's a little bit different than anyone else's, consider something from the Sabrina Collection at the Black Bow Jewelry Company. The initials boast diamond cut accents that really set the piece apart. Each pendant is made of sterling silver and measures approximately 15mm in length. One-half of each unique letter is oversized and exaggerated to make the initial stand out in silhouette against the metal. The pendants retail for about $21. 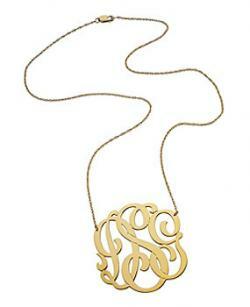 Make an elegant and detailed statement with this three-initial pendant from Jennifer Zeuner. Each initial set is cut in script from 18k yellow gold vermeil. The pendant measures 1-5/8-inches long and 1-1/2-inches wide and is created in an elegant script with the last initial centered between your first and middle initials. 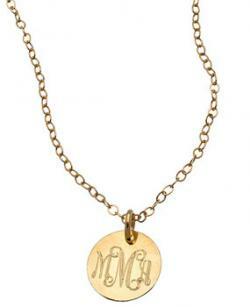 Because this necklace gives your initials as a monogram in script, rather than a stamped or engraved disc, the look is more unique and elegant than many other initial pendants. The pendant is hung from a 16-inch chain. The chain features a lobster clasp. The pendants retail for $325 from Neiman Marcus. Free two-day shipping directly from the vendor is provided. Allow approximately three to four weeks for delivery. If you want a personalized and unique pendant that has an urban flair to it, consider this Diamond ID Tag pendant from Ross-Simons. The tag is made of 14K gold and is encircled in pave-set diamonds (.3 total carat weight) for an elegant and sophisticated twist. The pendant has a rectangular shape that is unique among other initial pendants, making it ideal for those who like to stand out a little. The initial is engraved in the center of the tag and can be done in either block or script type. The tag measures 1-1/8-inches long and 5/8-inches wide. It comes with an 18-inch gold chain. The pendant retails for $750. Engraving takes three to five days before shipping. This pendant ships for free. Get noticed with the Cable Collectibles Initial Pendant with Diamonds from David Yurman. Each 18k yellow gold pendant is outlined in a rope design that circles the disc-style pendant, while the initial itself is set with pave white diamonds (.01 total carat weight). The initials are wide for visibility and are set against a matte gold setting. The unique rope outline has a slight sheen to accent the entire piece and, paired with the diamonds, sets it apart from other similar pendants. Each pendant measures 10 mm in diameter. The pendant comes with a 16- to 18-inch adjustable gold chain. Each pendant retails for $625 at Bloomingdale's. The pendant ships for free, usually within two business days. 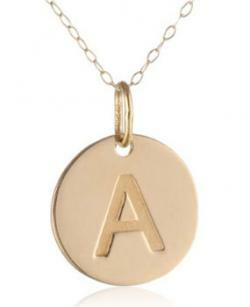 Gold initial pendant necklaces are the perfect personal touch to any outfit. Check out any of these unique and beautiful designs to find one that matches your personal style.